Walkin’ Pets not only offers the specialized products that your customers need, but also products flexible and adjustable enough for your practice to stock and sell. 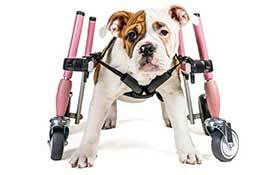 Our fully adjustable, off-the-shelf dog wheelchairs offer all the benefits of a custom-made cart, but without the need for complex measurements, expense, and build-time. In addition, our Professional Product Kits give you specially discounted pricing that make our products even more user-friendly! Our ready-made SPLINTS, available in bootie, hock, carpal, front, and rear, are also stocked by pet care professionals. They offer stability and support without waiting for costly molds to be created. Our NO-KNUCKLING TRAINING SOCK provides a training tool for knuckling that pet professionals have embraced. 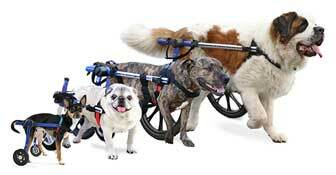 These are just some of our unique Walkin’ Pets products! Same day shipping on most orders. Overnight delivery and international shipping available.